We had **** all organisation yesterday we gave the freedom of the pitch to the best player in the whole comp. I would have been more than happy this season with a solid workman like team grinding out a few results here and there and hard to breakdown and low on excitement, a team with limited ability but gets stuck in, we are ******* miles away from anything like that. MV kicked us around yesterday and we bent over and took it without any come back, that isn't acceptable. 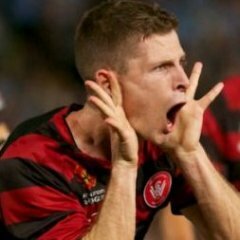 so﻿ are we (wsw fans) patient enough to wait for babbel to form some sort of structure in our team? He's been here as long as Gombau was, we should have a structure in place already. Gombau still didn't have structure the day he was sacked. If he was still here now he still wouldn't have structure. If we are going to compare Babbel to anyone it should be Kurz not Gombau. Gombau had heaps of A league experience, understood the differences here (should have anyway) and what was needed to win. In time Babbel may get his head around it. On the question of the penalty, I thought it was rather soft, if warranted at all. Harper, Boz and Thompson all seemed to accept the decision without question and without explanation, so perhaps someone here can tell me what I missed. From the comfort of my lay-back lounge and with only the benefit a single replay, the incident as I saw it unfold involved a ball though to Barbs who got his body between Elrich and the ball. Barbs then attempted to flick the ball over their heads, but in doing so, Elrich then managed to get his body between Barbs and the ball, With an awkwardly bouncing ball, Elrich went low to head the ball away, but in doing so caught Barbs' foot as he tried to kick at the ball from behind Elrich. That Barbs went to ground, to my mind, had more to do with his being off balance than with anything Elrich did to him. Happy to hear from anyone who saw something different, perhaps with the advantage of a slo-mo replay. Just felt this was a poor call against Elrich especially after the soft yellow he received earlier in the game. Some very good discussion here. OK the chop and change Popa, Gombaos, Babbel, very different styles with no overiding football philosophy from top to bottom means we are like a jenga puzzle waiting to fall over. Gombao was a coach with a very particular style that takes a while to adopt under a club management woth very little patience and players not willing to adapt. A similar thing is been played out now with Babbel. Certain players are digging in. Will manaegemt support Babbel? Look at SFC. There is a football philosophy that is consistent from the top all the way through to the juniors to the scouts to prospective youngsters looking to come on board. I'm not sure what the current state of play is with our juniors but a couple years back WSW youths were badly neglected. An accusatory rather than nurturing environment and Kalac very much neglecting his duties towards junior players. Sure we're **** but at least we have snazzy marketing videos. A number of players need to be moved on but is not easy to do so. In the meantime we wait for old man Bridge and Patrick 'sick note' Zeigler to come back and save us. I’m not sure how people say it’s not a pen, elrich is clumsy never gets the ball and takes him out when there’s a chance to score. If that happens away for us at in the east of Sydney every forum member is calling it pen. Babbel, Gumby, Popa, players and WSW board and owners hell even half of our members... pathetic memebers share blame who barely show up. Babbel doesn’t seem too concerned from his press conference he seems to accept it, I’m assuming he’s been told this season is a write off in terms of honours. It’s about a long term project. Get ready for a roller coaster season I guess. I’ve long heard out long suffering Boro and Leeds fans mention this in posts over the years. Oh sorry forgot to mention the only blameless person is Mack! Only one with clean hands! no I stopped us signing Zlatan because I wanted too much money to be his Australian agent. Our NYL team and W-League teams out scored the senior team. Both scored one goal. So we all looking forward to the derby? Always been too aggro for me...too nerve-wracking and intense. Luckily we live in an enlightened country where the teams are franchises and we don't do something so stupid as allow some to get kicked out every year. The biggest failure of the FFA if you ask me. All it has allowed for at times is a mediocre comp where teams know that regardless of how **** they are they get to go around next season. Players know they can most probably get a gig elsewhere so no incentive to improve. We first met at one - remember? But even that wasn't enough to have me like them! I forget exactly why......but, despite having briefly met you for the first time.... I left that game particularly not enjoying derbies. It wasn't just the result - which I'm sure went against us. The hostility from a certain proportion of the fans (probably on both sides) is what I dislike most. From memory, some in Blue that night were really aggro and gloatly was we left the stadium. I remember it being very unpleasant. For me the real problem is the lack of mental fortitude, particularly against our bogey sides: Victory and Sydney. There’s no toughness or stamina to compete with them, we (let ourselves) get intimidated far too easily and we don’t appear to have a winning mentality in general. We have a good team, we’re just very mentally weak and everyone else knows it. There are no particular culprits with this as I believe it’s been an issue for a good 2-3 seasons now, with multiple personnel coming and going. There isn’t a specific person to blame, though someone must be the catalyst for it to improve. I have a working relationship with someone involved at Sydney and every person in that club from the CEO to the receptionist who sits at their front desk honestly believe that they are the ******* bees knees of a club and will win every game they play. I’m sick of hearing it but you know what, it’s true and it works. I can’t say we have that and we haven’t for some time now. It’s sad to say that because for our first 2-3 years of existence they didn’t come much tougher than WSW. At the moment we are like a couple whose marriage is failing horribly but we think moving to a flash new house will fix everything.